There’s gold in them thar petitions! There’s an old saying, usually attributed to Otto von Bismarck,1 that laws are like sausages; it’s better not to see them being made. For one particular part of the law-making process, however, I beg to differ. So… did you ever wonder how those counties came to be formed? Bottom line: people asked for ’em. They did exactly what the First Amendment to the U.S. Constitution guaranteed them the right to do: petition the government for a redress of grievances.3 In many many cases, those original petitions still exist, along with hosts of others submitted at one time or another to the legislatures of the states and to the U.S. Congress. And they can be fabulous resources. Petitions for and against the creation of new counties or even smaller units of government are commonplace and can put an ancestor in a place at a time that no other record does. Live in New Jersey like I do? The loss of the 1800, 1810 and 1820 censuses drive you batty because you need to place your guy in, say, Monmouth County? Check out the New Jersey State Archives holdings for the State Legislature. The image that pops up on that page is… you guessed it… a petition from the Monmouth County freeholders to the Legislature in 1782. Among the Archives’ holdings: Petitions and Other Papers relating to County Courthouses and the Establishment of Counties, 1760-1858; and Petitions and Other Papers relating to Establishment of Municipalities and Municipal Boundaries, 1748-1859. Wanna see what a petition for a new county looks like? In 1837, some folks living in Washington County, Texas, east of the Brazos, petitioned for the formation of a new county,4 and the Portal to Texas History has the image online. Trust me on this one: if you’re a descendant of James W. Parker or Luther Plummer or Abram Zuber or Joseph Henson or a whole bunch of others, you want this. Big time. Sometimes kind souls will transcribe these petitions and put them online. Check out the petitions for the formation of Huntingdon County from the Pennsylvania State Archives, transcribed online at the Huntingdon History Research Network site. All five petitions for the division of Bedford County and the formation of a new County of Huntingdon are there, along with an additional 67 signers who opposed the new county. But legislative petitions cover so much more than just creating new counties. The depth and breadth of these records are stunning. 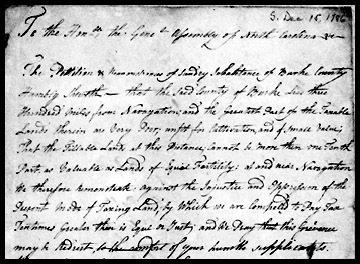 On 22 October 1776, residents of Albemarle, Amherst and Buckingham Counties in Virginia signed a petition against established churches, and for religious equality.5 The Library of Congress’ American Memory Project has images of that petition online, courtesy of the Library of Virginia. If you descend from Charles L. Lewis, James Stephenson, John Harris, Thomas Benge, John Martin, Martin Brannen, Abraham Eads, Absalem McQuery, Andrew Spradley or any of dozens of other signers… you want that petition in your files. And there are literally hundreds of other petitions on religious issues in that one Library of Congress collection. These petitions aren’t online, but they are on microfilm and the microfilm is available through Interlibrary Loan (ILL). The cost for getting five rolls at a time through ILL from the Library of Virginia? Nada. It’s free. • Other Texans were looking for protection from Indian attack. In 1849, the citizens of Limestone County — folks like H.C. Walker and L.C. Pleasants and John T. Bennett and about 50 others — asked Governor Peter Bell to order the forces at Ft. Graham and Ft. Worth to “cause said Indians to be immediately removed above the line of Said Forts and to prevent any further encroachments by them in to our settlements.”10 There’s a transcription and digital images online. • And speaking of Texas, folks from Vermont weren’t entirely thrilled with the idea of annexing Texas. Some 27 residents of that northern state signed a petition in 1844 opposing the whole idea.11 It’s online, with many other petitions, in the Petitions and Memorials set of the National Archives photostream on Flickr. • You did known that Benjamin Franklin signed a petition to Congress asking for an end to slavery, right?12 No? Take a gander at the petition, and an explanation, online at the National Archives site. • In Oregon, in 1854, the ladies wanted prohibition. • In Missouri, in 1842, people filed petitions for redress for property destroyed in the Mormon War. • In Alabama, in 1822, folks petitioned to pardon a man who bit off part of another’s ear AND to pardon another man who’d stolen a hog and horse since he’d already been whipped and branded. • In 1810, Daniel Boone asked Congress for a land grant in the Louisiana Territory. Oh… and that Virginia family I researched? None of ’em ever signed a petition to form any of the new counties they lived in. Two of ’em did sign a petition to create Roane County,14 but when Virginia did create Roane, it also created Calhoun County,15 and this family ended up in Calhoun. Go figure. Hmmmm, one of my direct ancestors was the first Gov of CT… and I think he was one of the founders of Newark NY (New Ark)… I suspect there’s a petition or two in the archives somewhere. Really, Judy, I’d never have thought of searching for these items! Of course, I’d TRULY love to visit and see the documents in person with personal signatures – sigh. Maybe one day. Thank you for a marvellous post – made me want to go see all the petitions you mentioned, and start off on another genealogical/historical distractin! Oh Celia — you can BET there will be some petitions there… to him if not signed by him. And probably many by later, more recent ancestors as well! Judy, One of my ancestors, Seth Hazel, apparently petitioned (maybe that’s not the correct legal term) the State of Texas for land in 1856 on the basis of his being in Texas before the 1836 war and for his service to the state of Texas. I’ve found the reference to a act of relief (Laws of Texas 1822-1897, vol 4, p 170, Chapter CCLXI, August 29, 1856)granting him a league and one labor of land. All well and good. But I presume he had to submit papers proving his entitlement to such a grant. Can you suggest where those papers might be? Or any other material that might have been created as a result of such a petition or request or whatever you would call it? First off, wanna see the land grant that resulted? It’s online. This file, which is at the website of the Texas General Land Office, even has your ancestor’s signature on the sale of the land right. (It passed through several hands before being patented to one Matthew Cartwright.) As for the underlying documentation, absolutely the Texas State Library and Archives in Austin. Start with the finding aids there. There’s at least a card file of memorials and petitions to the Legislature for the period 1836-1937, and that ultimately should get you to whatever still exists. Have fun! Well, thank you very much for that! You know, it’s interesting, but about 15 years ago I spent an afternoon at the Texas Land Office making copies of all the records they said they had from Seth Hazel’s various land transactions, and those included about 1/3 of the ones now online. It included a couple of others NOT online. So obviously, the moral of the story is to keep checking to see if more things turn up. I will go through the finding aids from the State Archives. Thanks very much for the link. I haven’t found him yet, but I’ve found a collateral feller I’ve been trying to track down during the Republic days. One page of reference to the Republic’s expenses trying him for murder. Whose? Dunno. When? Dunno. Where? Dunno that, either. But a very careful accounting of what all the apparent paperwork cost. More mysteries! Of course it could be a different man of the same name. If it was the one I’m tracking, they didn’t catch him, I don’t think. I’ve found him to Arkansas — and then dying. But it does offer a suggestion of one reason why he might have left Texas. Many thanks, Judy. So much to learn, so little time. Glad to help, Barbara! Sure wish these records had been online back when I was chasing some of my Texas ancestors, but it is interesting that what you’re seeing online doesn’t match the paper records you saw. Two different source agencies perhaps? Judy, along these lines, I have a House of Representatives Relief Bill: H.R. 5889, April 19, 1880 (46th Congress, 2nd session), for the relief of Russell Lamphere in the amount of $50,000. It doesn’t explain further. He is my ggg-grandfather. A New England cotton mill machinist, he moved his family to Tuscaloosa around 1855 in order to start a business; the Civil War ruined their business and after a brief stint in Meridian, MS they were back in New England by 1875. My gg-grandmother was reportedly bitter about having to move back, but we don’t know any of the details. I am hoping that somewhere there are backup documents for this bill, but I have combed the National Archives Finding Aids and don’t know what to ask for. Wrote to the regional NARA but they only said they didn’t have that on microfilm. I think the central NARA will accept photocopy requests but I have only guesses as to how this might be classified. Do you have any experience with these documents? Do they exist? It would be fun to visit D.C. NARA and seek this out, but I may not be able to do that for some time. many thanks for any guidance you can give! I’d bet large sums of money that you’re looking at Record Group 233, Records of the House of Representatives. There’s a wonderful finding aid online — Guide to the Records of the U.S. House of Representatives at the National Archives, 1789-1989 (Record Group 233) — and I’d be looking at Chapter 6 (Records of the Claims Committees). That should steer you in the right direction. What you had here was essentially a private bill, and whatever records exist should be in this set of records. Good luck! Judy you are an angel. That was exactly what I wanted to know. Now I can look into something specific. I plan eventually to try and make a photocopy request to the central NARA, but I think I’ll keep puruse everything I can find on this first. All the best and btw I so enjoy your blog — Diane. You’re most welcome, Diane! Good luck.